Microsoft Paint, also called Paint, is a simple computer graphics app that has been included with all versions of Microsoft Windows. The app mainly opens and saves files as Windows bitmap (24-bit, 256 color, 16 color, and monochrome, all with the .bmp extension), JPEG, GIF (without animation or transparency, although the Windows 98 version, a Windows 95 upgrade, and the Windows NT4 version did support the latter), PNG (without alpha channel), and single-page TIFF. The app can be in color mode or two-color black-and-white, but there is no grayscale mode. New (Ctrl + N): This option is used to create the New Document. Open (Ctrl + O): This option is used to open existing documents. Save (Ctrl + S): This option is used to save the current document. Save As: This option is used to save the document with new file name. Print Preview: To see the Print preview of the current document. Page Setup: To setup the page size and paper Orientation. 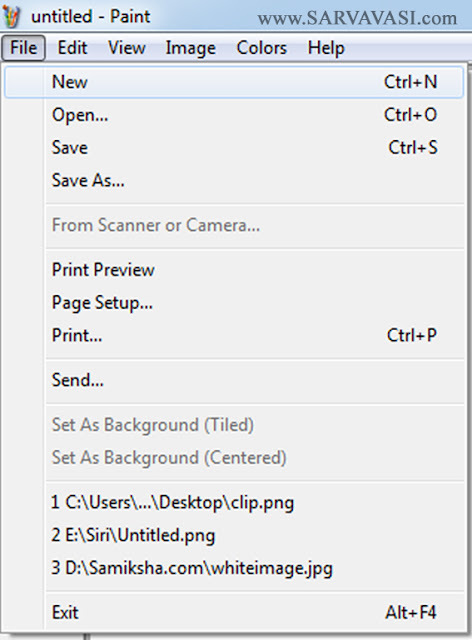 Print (Ctrl + P) : To take the print out of the documents. Set as Background (Tiled or centered): This option is used to set current paint as desktop background. Exit :( Alt+F4): This option is used to exit from Microsoft Paint.